Music Costs > How Much Does a Banjo Cost? How Much Does a Banjo Cost? A banjo is similar to other instruments such as a guitar. It is a four or five stringed instrument that is usually made of a plastic material. This instrument is generally used with bands that perform music such as country, classical and bluegrass. On average, a banjo is going to cost anywhere from $50 used to as much as $3,000 for a higher end, five-stringed banjo. Mass produced banjos found online, such as Amazon.com, can cost about $100 to $250, while a hand-crafted banjo can cost upwards of $3,000, especially if it’s made from a higher quality material. The Deering Goodtime Special Banjo, for example, costs anywhere from $700 to $950 for a five-string banjo that is brand new. The Fender FB-300, on the other hand, can cost between $300 and $425. Jameson Guitars has a five-string banjo that runs from $150 to $325. A beginner’s banjo kit will cost $150 to $300 for a lower-end model. According to BanjoWizard.com, if you want to build your own banjo, plan on paying as much as $500 to $2,000 depending on what you want your banjo to have. Piceonomics.com says a banjo will cost $150 to $300 for a beginner’s set, while a mid-range banjo can cost $300 to $425. A custom banjo can cost $2,000 to $3,000. On the market, you will commonly find the following types: a four, five or six string banjo. While rare, you may be able to find 12 string or even fretless banjos as well. The most popular type is the five string. The modern five-string will go from lowest to higher in sound, and the fifth string, known as the thumb string, will be attached to a tuner mounted on the neck, making it 25 percent shorter than the other strings. The modern four and six-string banjo will retain its sound, similar to a 19th-century banjo. These banjos tend to be plucked and can be strummed with a guitar pick. Banjos may either be an open-back or resonator-equipped. A resonator-equipped banjo will have a plate that’s fastened to the back fo the body; it’s designed so the sound can be protected, allowing the banjo to have more “punch” and volume. An open-back banjo will be mellower and will have a less complex construction. These banjos will weigh less and will have five strings. Most bodies today will be made with a circular wood rim and a tension head made from some sort of synthetic material, similar to a drumhead. Older banjos may be made from an animal skin or membrane. The strings should be made from metal and the fourth string will be wrapped in an alloy. Higher quality banjos will be made from maple, mahogany or birch. Some beginner kits will come with all the necessities such as the strap, case, strings and picks. If you purchase from a music shop, some will professionally string and tune the banjo free of charge. Most of your more popular brands will include a limited warranty that varies anywhere from one year to a lifetime. Be sure to check the paperwork to know what type of warranty you are getting. If you want to get your banjo tuned, music stores are going to charge about $25 to $50. Most banjos won’t come with a case. To protect your banjo from scratches, dings, and dents, a case is highly recommended. Most cases can cost anywhere from $40 to $200. For those who want to learn how to play the instrument, a professional tutor or instructional DVDs are going to be required. To learn the instrument via a tutor, it can cost anywhere from $30 to $100 per session. This will depend on the tutor’s experience and your local cost of living. Straps are ideal for those who plan on playing while standing up. A good strap will cost $10 to $20. A capo will clamp to the fingerboard, allowing you to raise the overall pitch. This allows you to play songs higher than what they were written in. A capo can cost $10 to $20. You will need strings sooner or later, and a good set of strings can retail for $3 to $10, depending on the brand. Tuners can cost $9 to $25. A broken banjo and other repairs may cost anywhere from $50 to more than $150, depending on the repair. It’s best to try the banjo in person. Find a banjo that is easy to hold as well as a banjo that has strings that are fairly easy to push down. If you’re new to the instrument, talk with a local music teacher to see what he or she recommends. Since each of us has our own technique and playing style, this is a way to find a brand/model that works for your style of play. It also doesn’t hurt to check out banjo reviews online to see what other people are saying. When testing a banjo, pay close attention to the strings. Do they push down easily? Make sure the strings aren’t hard to push down and don’t feel as they will slice up your fingers. Also, test the sound. When strumming, the sounds should be consistent. Be weary of cheaper banjos that are made in foreign countries. If you must spend less than $100 to $200 on the banjo, be sure to do the proper amount of homework. 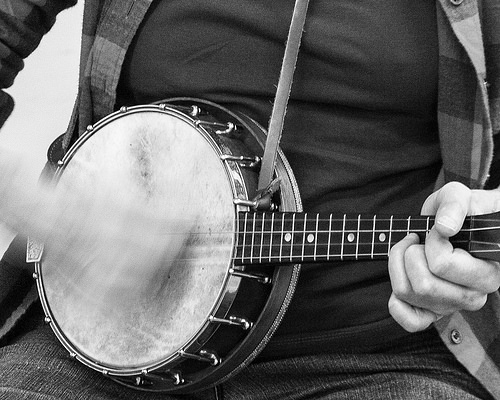 There are two popular banjo playing techniques: the clawhammer technique and the two finger up-pick. The clawhammer technique was one of the earliest styles. This style comes from the “clawlike” position of the hand, and it involves striking the four main strings in a downward motion while using the middle or index finger. The fifth string will be played by the thumb using a lifting motion. The two finger up-pick is more refined than the clawhammer technique and uses a three-finger style. Aside from these two styles, there are a handful of other bluegrass styles that are often named after the bluegrass players who played. If you are just starting out, you may want to consider purchasing a used banjo. eBay is a fantastic resource to get a banjo for less than $50. As you progress with the instrument, you can consider buying a higher-end unit. Consider purchasing all equipment secondhand such as the case, picks, and others. This can easily help you save 50% on your overall purchase.